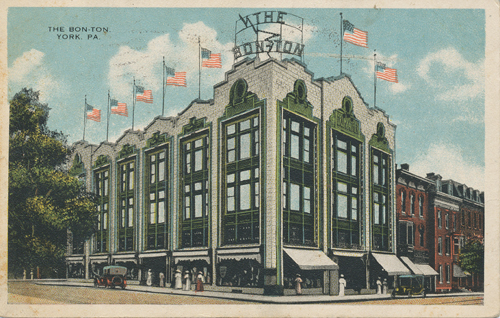 This postcard is of The Bon-Ton’s former location in downtown York. It’s a “Commercialchrome” card published by Fair & Square Bargain House of York, PA. It was mailed by Lucy Snyder of East King Street, York, to Freda Hatt of Annville, Ohio, with a postmark date of Oct. 18, 1917. Postage cost? One cent. This week’s column comes to you as I finish up a weeklong “staycation,” marked by a lot of yardwork at our family’s new home, some fun day trips around the state, and, most fun of all, very little working (except a break to write this column)! In the spirit of relaxing and going with the flow, I just picked a few of letters at random from my letter file to share today, and they happen to be about varied memories of downtown York’s past businesses. I hope you’ll find it as relaxing to read them as I did! She also recalled the Holiday Theater and 615 Lounge, which we just talked about last week. Diane also recalled the 615 being called “The Numbers,” which other readers had mentioned as well. Marian continued, “Off the cuff, talking about stores. Remember Wiest’s Department Store? They always had a parrot in their store that talked and I would bring my children in just to see and hear the parrot.” She also recalled McKinley School in York, including its principal for many years, a Mr. Contino, as well as roller-skating at Playland. “My husband and I would spend date nights there,” she said. Marian, I’m so excited that one of your most important memories ties into the park about which so many people have shared memories – how truly awesome! Mary said she is now in her 80s and is hoping more Yorkers also remember Krout’s!